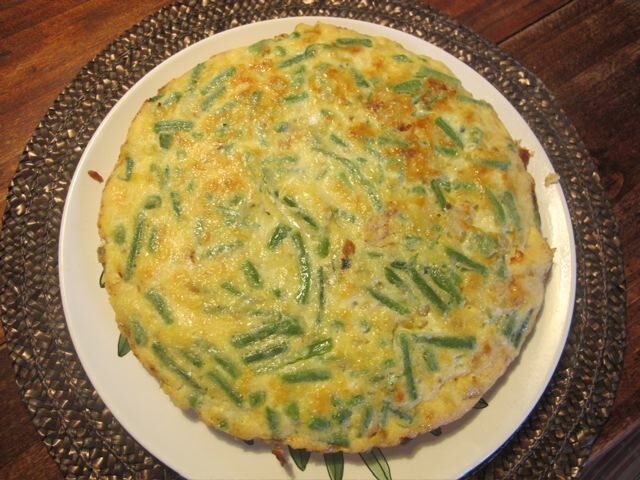 “Just when you thought you’d had enough green beans for a while…” Meredith sighed at lunchtime, as she bit into a piece of this green and yellow discus–a frittata with green beans. Frittata is an Italian omelette–made the opposite way to a French omelette. I’ve been guided in their making by the incomparable Marcella Hazan–the queen of Italian home cooking. The “trick” is in the time it takes. It’s cooked over the lowest heat, for about 15 minutes–a French omelette over the highest heat, for probably less than a minute! The French version is fluffy–the Italian firm, but not dry; more like a pastry-less quiche–served in slices. What they have in common, apart from eggs, is that you can fill them–frittatas or omelettes–with pretty much what you fancy. Sauté the onion in the olive oil until it colours nicely–set aside to cool. Break the eggs into a bowl and whisk them lightly to combine the yolk and the white. Whisk in the grated cheese. Add the beans and the onions to the bowl and mix them in. Heat the butter and the extra oil in a medium sauté pan [10 inch/26 cm] to hot. Fold in the egg mixture and turn the heat down to the lowest available–even use a heat diffuser too if you have one [the object being to keep the frittata moist through slow cooking]. Cook for about fifteen minutes until there is just a little lake of liquid left on top. Heat the grill to hot and place the pan under it for a couple of minutes, just to firm it up. “Great finish to the bean season,” acknowledged Meredith, after helping herself to a second slice…. Thank you. Just the thing for today: the beans are petering out here too. Two concerns: 1) I don’t expect to score as highly as you do on presentation 2) I’m probably less careful than you regarding diet, but I feel uneasy as regards the number of eggs, nutritious as they are (do I understand that you and your wife had 3 eggs each?). Good question and thanks, Liz. As you see from the final photo there is half a frittata left at the end of lunch. Therefore, strictly speaking, we had one and a half eggs each. I usually put two eggs in each French omelette–so we eat more eggs–just–in a French omelette! I’m not sure that we would be leaving half a frittata! Thanks, though. One and a half seems about right. non vedo differenze tra frittata italiana e francese, sta nella fantasia di aggiungere gli ingredienti più gustosi, questa con i fagiolini deve essere stata super !!! !gnam !!!! 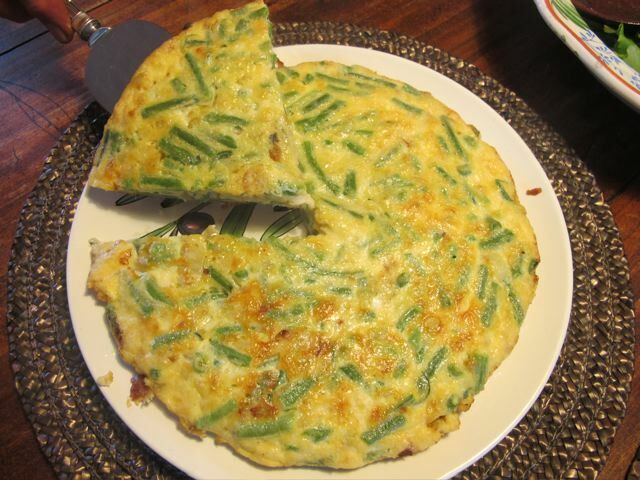 I do not see differences between Italian and French omelette, the fantasy is to add more tasty ingredients, this one with the green beans must have been super!! yum! !excuse me this is in english!!!!! This looks really great. I love using green beans in things like this – they go so well. I think that this is just what is needed something light but filling. I told her about your web-site and gave her my copy of your cook, she was so thrilled about & said why was it not known in Swenden? she is going to a meeting with others who are diabetics they have regular support clinic’s it seems when she gets back, and has promised to make sure your book gets known to them. It is a shock to be diagnosed–I experienced that myself. I’m not surprised to hear it is in Jo’s family–my mother was type 1 and her uncle type 1 too. One day perhaps the book will be translated into other languages–meantime there is Amazon! Happy to hear the salmon went down well! Yes it’s always a shock when you think you have escaped a thing,as Jo said at 56 she thought she had. Jo’s mum was type 1, her brother seems to be alright up to now,but her sister has been diabetic 1 since her early twenties. One day Robin hopefully there will be maybe just a pill you can take to cure it,let’s hope so.But till that time comes it’s thank’s to people like yourself who are willing to put in the time and effort to help others come to turns with this beast.I know how hard it was for Jimmy to come to terms, and still is fifteen years on. Sorry about the double take must have pressed the damned thing twice. on October 11, 2011 at 11:18 am | Reply Dianne P.
I get lots of requests for veggie frittatas whenever we have morning meetings at school–though we also eat it for lunch, of course. 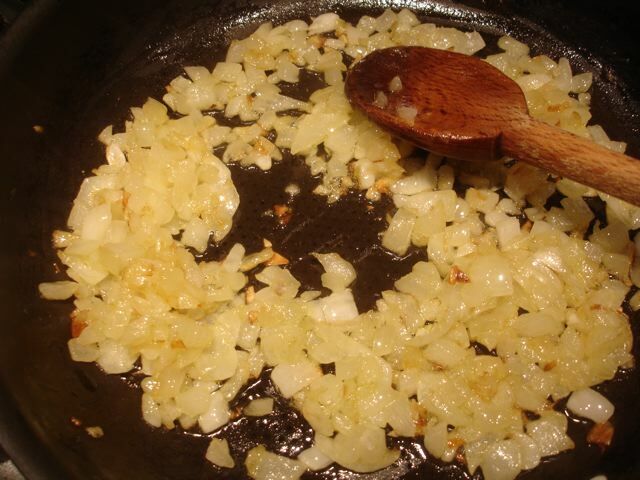 I’m going to try your variation w/olive oil & extra onions–sounds good! I know you like mushrooms; I make it with any combination of mushrooms & red peppers, or carrots & green beans, or brocolli & carrots, etc. Just divide the amount of veggies in half for each ingredient. When I’m thinking about our cholesterol, I replace an egg or two with just the egg whites, plus 1 extra white. (I don’t think it’s as good without ANY yolk, though.) But the secret ingredient I add is about 1/4 cup of Ranch dressing…and I sprinkle a bit of Parmesan on top before baking. Adds some zip to it! Meredith just filled me in about “Ranch” dressing–I’ll check it out when we’re in the States. 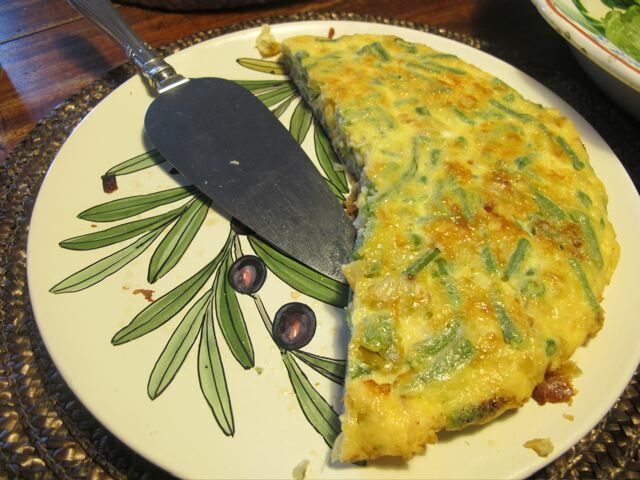 on October 11, 2011 at 10:49 pm Dianne P.
Your recipe for green bean frittatta came just in time for figuring out my weekly menu! I was able to convince my husband to try it for dinner tonight (some Irishmen are not very adventurous when it comes to eating) and he loved it! He even agreed to forego his customary chips/potatoes and had cole slaw instead! Next time, though, I will make a smaller one since six eggs were a bit too much for us. Also I added oregano, a clove of garlic and some basil jsut to spice things up a bit. Thanks for the delicious recipe and chance to get my husband to try something new and healthier than his usual fare. The recipe, I forgot to mention, is for four! !